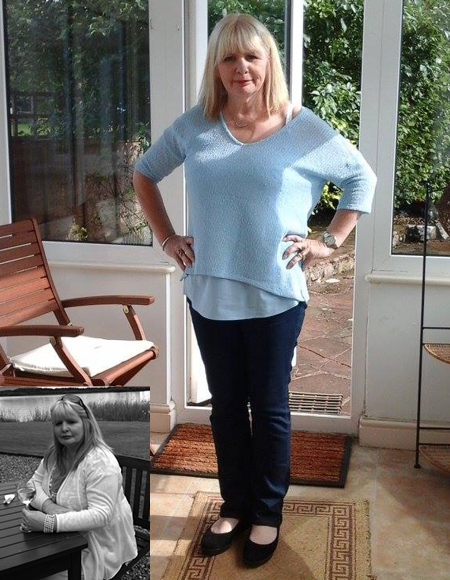 I had lost just under a stone before I started Nutracheck - so 6st and 8lbs92lbs202.8kg in total. My son bought me an XXL t-shirt from Florida and it was so tight - I decided at that point that now is the time. I made the decision to keep a diary of my food intake and googled calories. Nutracheck came up and it's much easier than working it out myself. I have struggled with my weight for years. I was in the habit of yo-yo dieting - losing weight then putting it back on, plus a bit more. It wasn't until I started using Nutracheck that I began to eat better and lose weight. However, it was fairly easy to fit the changes into my lifestyle. Going out to eat - so for the first couple of months I didn't go to any restaurants. I then decided to set my calorie target lower during the week and save calories for the night I was going out. I'm a lot healthier than before, I used to hate walking anywhere. My husband took me away recently, on a walking holiday, and one of the days we went for a 5 hour walk - which I loved. I would have made excuses before. I have also joined the gym and bought a treadmill - I couldn't have imagined doing either whilst at my heaviest. I went from a size 22 to a 12 and have gone down a shoe size. Last year on holiday I wore my first bikini in my adult life. What tips would you give to anyone who has weight to lose? Buy a good set of kitchen scales and bathroom scales. Also write down every single thing you eat or drink.